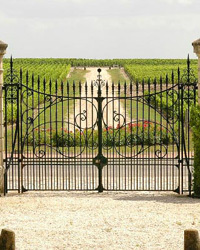 France’s biggest wine region, Bordeaux, is known for grand châteaus and high-priced reds. 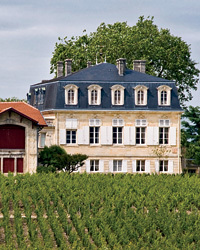 But Bordeaux has an affordable side, says F&W’s Ray Isle, who explores its most intriguing wineries, restaurants and hotels. I was sitting on the terrace at Château Carbonneau when it struck me what a bargain traveling in Bordeaux could be. It was late evening, and I’d just finished having dinner with Carbonneau’s owners, Wilfrid and Jacquie Franc de Ferrière, whom, in addition to making very good wine, run their château as a B&B. I had a glass of wine in hand, and beyond the marble balustrade, in the pond at the edge of the lawn, a chorus of frogs had started up—an extraordinarily loud chorus, in fact, which made me think something along the lines of, “Good grief, no wonder the French eat them.” Frogs aside, the night was peaceful and balmy, the moon was shining through the glass walls of the greenhouse to my left—a folly of Carbonneau’s original owner, back in 1867—and the vineyards beyond the yard stretched out into the darkness. Staying here, I realized, dinner included, cost me exactly what I’d paid for a night in a thoroughly nondescript hotel near the Sonoma County airport not long ago. Dinner not included. That’s the great, unknown thing about Bordeaux: It doesn’t have to cost a fortune. My entire plan was to spend three days in Bordeaux—arguably the most famous wine region in the world—without spending any more than I would if I’d taken a three-day trip to, say, Trenton. I’d stay in under-the-radar hotels, eat terrific food at affordable restaurants and visit some of the region’s best wineries—specifically the best wineries making bottles that sell for less than $25. On my first night, I stayed in the city of Bordeaux, at the Hôtel L’Avant-Scène ($150 per night). L’Avant-Scène is in the up-and-coming Chartrons neighborhood, a block or so from the riverfront—once a gloomy wall of derelict warehouses, now a flower-lined pedestrian promenade. The hotel’s nine rooms are surprisingly spacious and decorated with an eclectic mix of modern and antique furnishings. Since walking is free, I ambled for 15 minutes or so along the Garonne River to the historic town center. I was hungry, which was no surprise, since not to want to eat in France is to be dead, as far as I’m concerned. And while it’s possible to spend a fortune on a meal in Bordeaux, you certainly don’t have to. Traditional Bordelais cooking isn’t the stuff of $50 entrées. The cuisine is mostly rustic and sustaining: simple cuts of grilled lamb, for instance, or fresh oysters and mussels from the nearby coast in Arcachon. The Franc de Ferriere family.Photo © Martin Morrell. Château Carbonneau, a B&B and wine estate, that has been owned by the Franc de Ferriere family for generations.Photo © Martin Morrell. 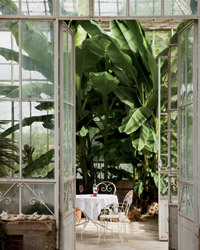 Hôtel L’Avant-Scène is near Bordeaux’s historic city center and the revived riverfront.Photo © Martin Morrell. An even more affordable approach is to eat at one of Bordeaux’s many wine bars. Wine by the glass is radically cheaper in Europe than in the US, and with a little cheese, some saucisson or duck confit, fresh butter and good bread, you can have a wonderful meal for not much money. This strategy led me to the slightly scruffy but entirely charming Le Bô Bar, on the Place St-Pierre. Le Bô Bar focuses on organic, small-production wines—a few from Bordeaux but mostly from other parts of France. Along with my “petit” charcuterie plate (enormous, and only $7), I had a glass of Bruno Duchêne’s La Luna, a raspberry-rich blend of Grenache and Carignane from the Roussillon, for a whopping $4. In fact, I had two glasses. They made me feel mildly guilty. What was I doing, drinking organic Roussillon in the heart of Bordeaux? To make up for it, I went around the corner afterward to the recently opened Aux Quatre Coins du Vin, where, thanks to the Enomatic wine dispensers on hand, I could try five different Bordeaux—one-ounce tastes—for a little less than $12. It more than made up for my betrayal. When I checked out of Hôtel L’Avant-Scène, I headed to St-Émilion. More than any other region in Bordeaux, it encompasses both the grand and the humble, its few great estates counterbalanced by hundreds of small family farms. And though I was concentrating on bargains, my first visit was to Château Canon, near the top of the St-Émilion hierarchy. Built in the 1700s by Jacques Kanon, a privateer (i.e., a government-approved pirate) who worked for Louis XV, it’s a gorgeous property—limestone château, abundant flower gardens, walled vineyard running right up to the town of St-Émilion itself. But, in what might be considered a nascent trend, Canon has also recently made itself much more friendly to visitors. With an appointment, a tasting of the château’s powerful, dark, long-aging red—which costs about $150 a bottle in the US—is free. Another example of Bordeaux’s growing friendliness toward wine tourism is the Relais Franc Mayne, just outside the town of St-Émilion, where I stayed that night. Though Château Franc Mayne has been in existence since the 16th century, only since 2009 has it had a hotel, and a fairly whimsical hotel at that. Each room at Franc Mayne has a different over-the-top design scheme (there’s even a tree house that looks like a Swiss chalet). I stayed in the ground-floor “black and white” room: white walls, black and white linens, black lamp shades, white pillows, black dresser and black-and-white-checkered tile floor. The next morning, as I drove to the Francs-Côtes de Bordeaux appellation, the land became more hilly, the back roads twisting through vineyards (and also, oddly enough, past several kiwi orchards). I was headed to Château Puygueraud, a pretty building atop a hill with a distinctive pointy turret like an orange witch’s hat. There, Cyrille Thienpont, whose father co-owns Puygueraud (and whose extended family owns the famed Pomerol estate Vieux Château Certan, along with several other châteaus) led me past ranks of barrels in the cellar to a line of glasses waiting on a wooden table. To me, Puygueraud is a model of the kind of value Bordeaux can offer. Made mostly from Merlot, it’s polished, substantial, full of character, ageworthy, and yet it’s still incredibly affordable. 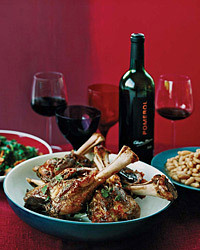 The 2008 suggested black cherries and currants, lifted by a spicy herbal note. 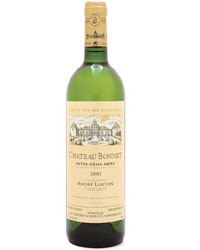 Tasting it himself, Thienpont said, “The 2008, for me, is what Bordeaux makes best—for a winemaker, it’s a modest version of a great vintage.” On the other hand, the 2009 and 2010, which we tasted next, are both from truly great vintages. The ’09 Puygueraud was less spicy than the ’08, a more sultry wine, saturated with dark fruit; 2010, my favorite as well as Thienpont’s, had all the rich depth of ’09 but with more elegance, power and structure. It struck me as comical—and just plain great—that you could buy it for under $20. From Puygueraud, I drove west to Château Clos du Roy in Fronsac, where I met up with owner and winemaker Philippe Hermouet. Clos du Roy’s wine, which is also Merlot-based, is (like Puygueraud) exactly the opposite of the flaccid fruitiness that characterizes a lot of affordable New World Merlot. It’s taut and focused, full of bright blackberry fruit supported by fine tannins. We tasted Hermouet’s 2009 and 2010 vintages; then he got up to find a bottle of the 2005. As I sat there, comparing the wines—the ’09 richer and broader, the ’10 more powerful and licorice-edged—I overheard Hermouet’s wife in the other room mentioning that someone needed to pick up their son from soccer practice. It crossed my mind that this was a very different experience from a visit to the typical Napa Valley tasting room. Instead of a gift shop selling scented candles, there was a sense that the family and the winery, the place and its people, were inseparable. It’s the kind of realization that makes the wine in your glass particularly memorable. Which struck me as a good ambition, in fact, for Bordeaux as a whole. Château Carbonneau, a gorgeous B&B and wine estate in Bordeaux.Photo © Martin Morrell. Located in a restored 18th-century house, it’s a quick walk or a five-minute tram ride from Bordeaux’s historic city center. Doubles from $150 per night; lavantscene.fr. Guests at this 12-room hotel in St-Émilion can tour the adjacent winery free of charge or bike through the vineyards. Doubles from $185 per night; relaisfrancmayne.com. Co-owner Jacquie Franc de Ferrière prepares superb dinners at this property outside St-Émilion for guests (for a small fee), using produce from the estate or nearby farms. Doubles from $100; chateau-carbonneau.com. Les Belles Perdrix, located just outside just outside the town of St-Émilion in Bordeaux.Photo © Martin Morrell. This gorgeous outdoor spot for lunch at Château Troplong-Mondot is just outside the town of St-Émilion. chateau-troplong.mondot.com. Owner Benjamin Bouet’s four Enomatic machines offer tastes of 32 different wines. 8 Rue de la Devise, Bordeaux; aux4coinsduvin.com. Its store has a terrific cheese selection, plus artisan preserves and raw-milk yogurt. 66 Rue du Pas-Saint-Georges, Bordeaux. Waiters serve a wide range of organic and biodynamic wines from all over France, plus charcuterie from a local farm. 8 Pl. St-Pierre, Bordeaux. A bottle of Château Jean Faux’s rosé.Photo © Martin Morrell. None of these châteaus charge a fee for tastings, but visitors definitely need to make an appointment. Located in the underappreciated Fronsac region, Clos du Roy makes an appealingly balanced, Merlot-based red. vignobleshermouet.com. Puygueraud is in the Francs-Côtes de Bordeaux, one of Bordeaux’s smallest sub-appellations. nicolas-thienpont.com. Pascal Collotte’s organically farmed estate is in the Bordeaux Supérieur region, near the town of Sainte-Radedgond. chateaujeanfaux.com. Canon’s premier wine is hardly a bargain, but its second wine, Clos Canon, is also terrific and costs much less. chateaucanon.com.